Propulsion river expeditions was officially created on December 10th, 1982. In fact, the founder Marc Masson, was operating for already two years the company, a company that became a reference in whitewater world. With is beloved wife, Marie Guay, they started a wonderful history, while staying at the head of the company for more than 20 years. It is thanks to a scholarship that Marc can buy his first rafts from the United States: some Achilles boats. He will gradually expand his inventory and improve it with the new auto-emptying models. Today, Propulsion owns more than 25 boats and uses them more than 120 days per year. 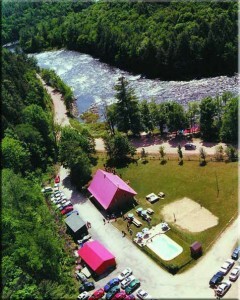 The Rouge River is now recognized as one of the most beautiful and exciting commercial rafting river in North America. Marc Masson and Propulsion certainly did a difference for it. An exemplary professionalism emerged with years, for a sport that did not have any parameters when it started. The pioneers Marc and Marie Masson allowed thousand of people to live a unique experience. May you be a raft guide or a customer, the Rouge River may change your world as it did for me. I experienced the sport for the first time in 1989, sport that I first qualified as a “completely crazy sport”. 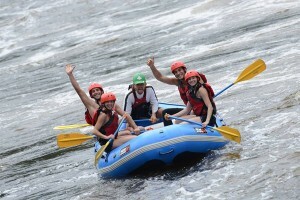 I almost became a raft guide is spite of me, but work quickly became a passion, I would say almost a drug, that led me everywhere in Quebec and United States. In 2001, I got myself more involved in the company while becoming the Operating Director and in 2006, I jumped in and became the new owner. We say the farthest we can look in the past, the farthest we can see the future. With more than 20 years of experience, I am really optimist for the next 20 years. I am convinced that they will be fulfilled with lots of adventures and several new people to meet.